I chuckled as I read this opening line from a long-time ICR supporter. I’d sent a personal note of thanks for his generous gift for the ICR Discovery Center for Science and Earth History and included an update on recent developments. My brief note, it seems, inspired him to respond with this marvelous testimony. With his permission, I’d like to share his thoughts. 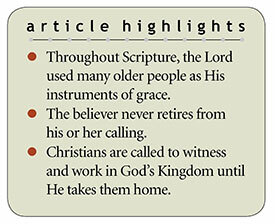 Throughout Scripture, the Lord used many older people as His instruments of grace. Joshua’s campaign to conquer the land of Canaan seemed somewhat out of place in this letter. But as I reflected, I began to see how it applies not only to ICR’s ministry but to all Christians everywhere. References throughout the Pentateuch and the book of Joshua indicate that Joshua was at least 80 and likely older at the time of the conquest. He had endured 40 years in the wilderness, and after Moses’ death spent several years leading the children of Israel in a long, hard battle for Canaan. By the time of the events in chapter 13, Joshua was most certainly “old” and “advanced in years”—so much so that God even told him he was old! But there was still “very much land yet to be possessed,” and rather than allowing Joshua to enjoy the fruits of his labor, God sent him out once again to conquer new territory. The testimony from our long-time supporter reminds us there is no such thing as retirement for the Christian. For those who love and serve the Lord, there is always more Scripture to study, more resources to be earned and given to ministry, and more people to witness to and reach with the gospel. Even those who are limited in some way have much praying to do. No one who has tasted the redemptive love of Christ is ever too old to possess more “land” for Him. Christians are called to witness and work in God's Kingdom until He takes them home. Just as Joshua was called to continue God’s work, we are called to keep working and sowing so that we may “still bear fruit in old age” (Psalm 92:14). ICR still has much “land” to win for the Lord, and the ICR Discovery Center will greatly expand our ability to do so. Conservative estimates show at least 100,000 people will visit each year, and many will come to accept Christ because of it. Please join with us through your financial gifts and intercessory prayers to reach “the generation to come” with the truth of “His strength and His wonderful works that He has done” (Psalm 78:4). Cite this article: Henry M. Morris IV. 2018. Christian Retirement?. Acts & Facts. 47 (6).